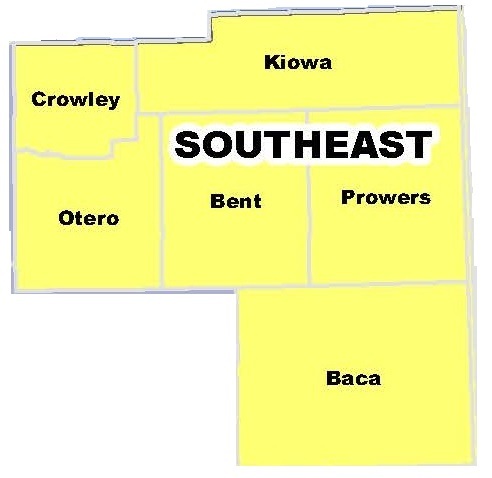 tHE sOUTHEAST Colorado all hazards region includes baca, bent, crowley, kiowa, otero and prowers counties. our mission is to prepare, respond, recover from and mitigate the effects of natural or man made disasters. generally characterized by the Great Plains. The region covers some 9,598 square miles of land and 65 square miles of water, and elevations range between 3,000 and 6,000 feet, which increases from east to west. 85 % of the planning area is devoted to farmland and agriculture use. The major rivers in the region include the Arkansas River, Big Sandy Creek, the Purgatoire River, Cimarron River and Two Butte Creek. Major roadways include US 50, US 385, US 287, US 350, US 160, State Highway 96, State Highway 71, and State Highway 10. The climate of the Great Plains is characterized by dry winters with occasional wind-blown snow and alternating periods of very cold temperatures followed by very warm days. Springs are windy and highly variable, including the occasional blizzard, rapid and drastic temperature changes, and high levels of precipitation in the form of both snow and rain. Summers offer low humidity with hot days and cools nights. Large thunderstorms are common and some of the most ferocious hail storms in the entire continent occur here. The fall is cool and dry. Overall, the area is considered semi-arid. The Southeast Colorado All-Hazards Region is made up of emergency managers, as well as other partner agencies, that comprise the six counties in Southeast Colorado. This group is responsible for the management of all emergency preparedness program areas within Southeast Colorado. the primary role is to develop and implement comprehensive emergency management planning, mitigation and response activities within the region under the provisions of Colorado statutes. Additionally, the emergency managers lead the develop and maintain all-hazard emergency plans for all types of natural and man-made hazards, and provide the analysis and recommendations necessary to make decisions that will effectively save lives and protect property in such emergencies. Prior to September 11, 2001 Colorado's primary response and preparedness capability was at the local municipal and county level. In August 2002, Governor Owens announced the establishment of seven regions to support this response and planning capability. These seven regions were later expanded to nine as part of the continuing effort to coordinate our response and foster the development of professional relationships. Governor Owens' Executive Order in July 2003 designated each region as an All-Hazards Emergency Management Planning Region. He further ordered all State departments that are responsible for public health and safety to recognize and adopt the single regional planning and operations map for purposes of emergency management and response. Top Circle - The name of our region. To remind us and others of who we are. Bottom Circle - the counties included in the region is listed to remind us that we serve with pride in each of the counties and not just our own. The Stars on Each side of the Circle - Remind us to reach for the stars. Always attempt to reach our goals and prosper in all that we do within the region. The State Flag in the center: The white in the flag symbolizes Colorado's snow capped mountains, the blue symbolizes the clear blue skies, the red symbolizes the reddish soil, and the golden yellow represents the Sun. SECAHR - Located over and incorporated in the State flag represents our region and symbolizes our region being a part of the state by utilizing the C of the State flag. The Bald Eagle - is the emblem of the United States of America. It was chosen due to its long life, great strength and majestic looks. It is with Eagle that we are reminded that together as a region we can have great strength and conquer great tasks. The color wheel background - This serves to remind us that we are not all alike and all have difference. We all come from different view points and have different ideas. Once again together we can accomplish great goals. Apart we are weak and are only one dimensional. This is what makes us strong as a region. ​Prepared. - This motto reminds us that we are and must remain prepared for anything. For You. - reminds us that we are working for you. The citizen, traveler and visitors of the Southeast All-Hazards Region located within the State of Colorado.